We really enjoyed sharing this pie recipe with you in December. Our readers seemed to agree, so we decided to create a new feature called THIS MONTH'S PIE. Once a month we will be baking a pie, sharing the recipe, and letting you know thoughts on it. 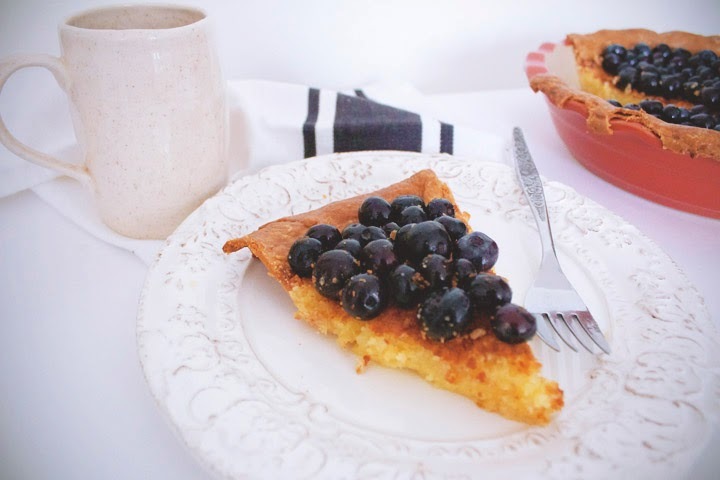 This month I decided to make a lemon chess pie with sticky blueberries. Never having baked one before, I was really excited and nervous to see how this pie would turn out. Not only did it taste great, but it looks delicious too. The lemon favorite isn't overwhelming, but definitely has a strong presence. 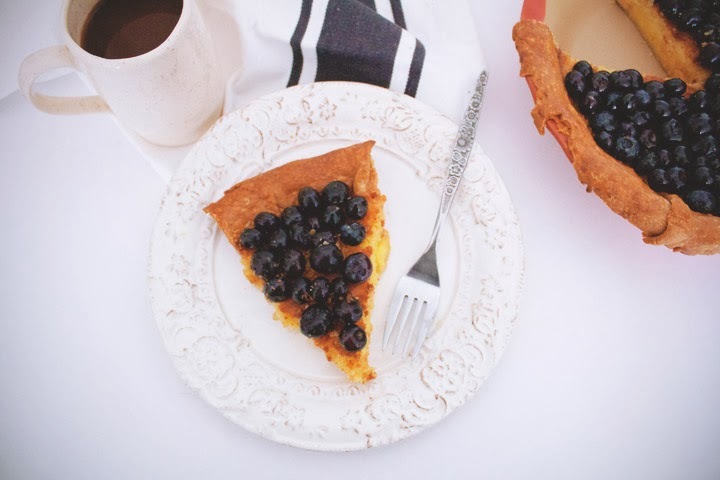 The sticky blueberries go great with the lemon and really add a nice second flavor to the pie. Also for this pie, I tried a "pie wash" on the crust to give it a bit of a golden color. I will for sure be making this one again! I got the recipe from this pie book. In a stand mixer (paddle attachment), combine sugar, butter and salt. Zest lemon and add to the ingredients (keep lemon to juice later). Mix together on medium speed for 2-3 minutes, until light and fluffy. While mixer is one, next add in the cornmeal and flour until combined. Add in eggs one at a time, scraping around the bowl after each addition. Turn mixer to low and slowly pour in milk. Finally put in the lemon juice. Finished batter will be slightly lumpy. Pour batter into an unbaked 9 inch pie shell. Put in oven and bake for 50 minutes to 1 hour, rotating 180 degrees every 20 minutes. Bake until a dark golden brown crust forms on the top and the filling is set. 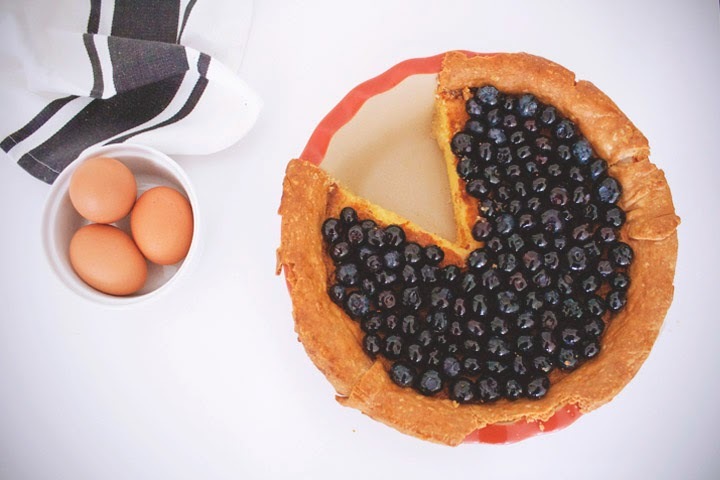 Let pie fully cool on a cooling rack, then top with sticky blueberries. Place sugar and water into a saucepan and stir until combined. Bring mixture to a boil over medium-high heat, stirring occasionally. Place blueberries in a colander with a large bowl underneath. Pour hot syrup over the berries. Let the berries fully cool then pile on top of pie.